Strawberry Chic: The Best Cornbread Ever! I know it's been a while, but i'm excited to say that I am finally ready to start posting recipes again! Up until a couple of weeks ago I was still feeling a little pregnancy nausea. It was a challenge to just get dinner on the table, let alone take pictures of it. Now, I know what your thinking..." but what ever happened to Something Sweet Wednesday?" Don't worry it's not gone forever, just on a temporary break, due to the fact that I'm just not craving sweets like I use to. 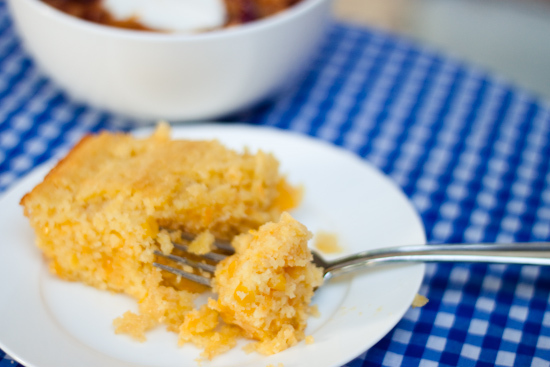 This cornbread recipe pair's perfectly with a hot bowl of chili! It's one that my mom has been making since I was little and every time I have any other cornbread it just doesn't even compare (sorry no offense :). It's super flavorful and incredibly moist at the same time. 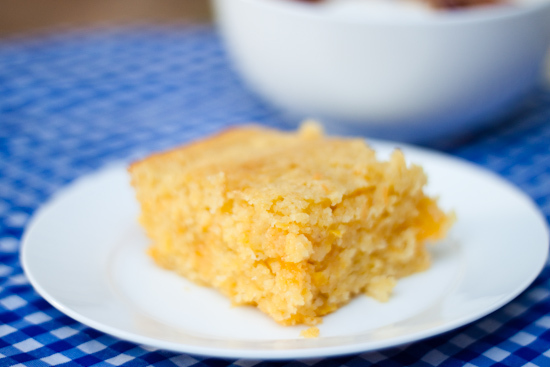 If there was such a thing as corn bread cake, this would be it! Directions: Set the oven to 350 degrees F.
Add the eggs, cream of corn, and cheese, mix well. *You may need to cook the bread a little longer...a good way to tell if it's done, is if you press down on the bread with your finger and it bounces back. This sounds so good! I love cornbread that has cheese in it! I'm bookmarking this for next time we have chili! Also, I'm glad to hear that some of the pregnancy nausea is abating! Ohhhh thank you! I am SUCH a cornbread fan!!! Especially with warm butter. Not sure how I came to your blog but I ve enjoyed reading it. I am in the UK and just had a question about the cornbread recipe. I can find out equivalents for the cup measurements and I am presuming the cornmeal is the same as Polenta but could I check that the cream of corn is corn that has been liquidised ? I look forward tomaking it as an accompaniment to my next Chilli. I tried this recipe tonight. The only difference is I creamed frozen corn. It was DELICIOUS! Thank you for a signature recipe!